This week I was lucky enough to play Chiptune Champion, a fantastic little rhythm game that lets you play with chiptunes. It controls well, is sufficiently difficult, and provides a great “Hey, I’m bored, so let’s sit down and play a game with sweet music for a little bit” experience. On top of this, the song selection in the demo is very well done, and highlights exactly why this game is one you should be watching, especially as a rhythm games fan. Yesterday, I sat down and spoke to Blake Garner, the developer of the game about how development is proceeding. 1. How are you, and would you like to tell us a little about Chiptune Champion? I’m great, thanks. 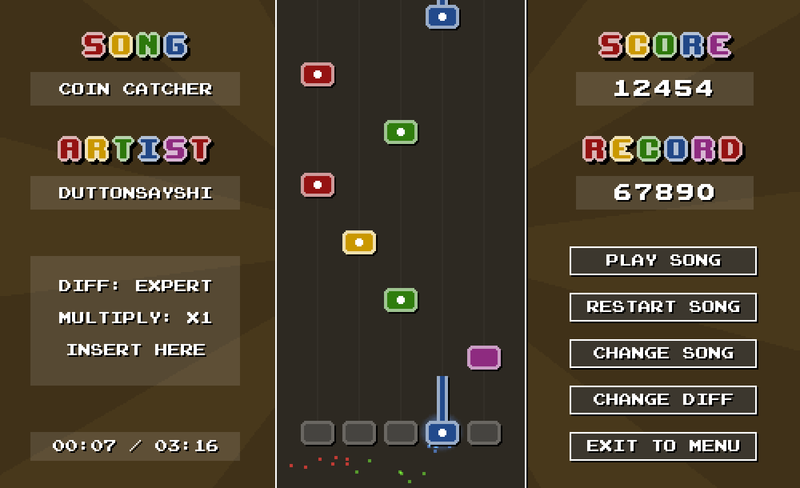 Chiptune Champion is a musical rhythm game, similar to guitar hero, where you play along to the melody of chiptune music by using your keyboard as a guitar. The 1 to 5 number keys represent the strings and the enter key is used to strum (although these keys can be changed in the options menu). What sets it apart from similar games is that I’m aiming to build a competitive, interactive community through the use of a track editor for custom songs, steam workshop support to allow public sharing of these tracks, online leaderboards, player profiles, an experience and level up system and achievements. 2. How was the game funded? Did this add stress levels to the development of the game? I have not acquired any type of funding for the game. I simply work on it in my spare time, which I’m lucky enough to have quite a lot of. I’m also not outsourcing anything and instead doing everything myself, so initially I was quite overwhelmed by the large workload that was ahead of me, but I’m now comfortably past the halfway point and it’s starting to look more and more achievable. 3. How has it been dealing with Steam Greenlight? It’s been an interesting experience for me. The amount of exposure your game gets in the first week after submission really caught me by surprise, as new comments were coming in every 10-15 minutes. Admittedly, it hasn’t done particularly well though in terms of the votes at 74% no, but I’m still happy to see 1000+ yes votes on my stats page, as well as a number of enthusiastic comments from some keen people. 4. Chiptune Champion is titled as a homage to Guitar Hero, were you a big fan of these games? What else inspired Chiptune Champion? Yeah, I was really into these games back in the day. I played quite a lot of Guitar Hero, but even more of a browser game by the name of Jamlegend. I was even lucky enough to become a ‘producer’ for the site, meaning that I was a part of the team that put the note tracks together for the new songs that were submitted to the site. Recently though, these types of games seemed to have fallen off the radar a bit and this is what inspired me to create Chiptune Champion. I wanted to make use of the experience I have with these types of games and bring this awesome genre back into the light. 5. Is there a special trick to developing a rhythm game? What comes first, the mechanics, or the song choice? Well, I began by putting together the base game engine and mechanics, without any audio, and with notes placed randomly just for testing purposes. Once I had that down, I went ahead and picked out a few songs. Next, I needed to program a track editor which I then used to create the note tracks for each individual song. Finally, these tracks needed to be exported and imported into the game engine, along with the audio and there you have it! Obviously, it’s much more complex than that, but that’s the general idea. 6. What has been the easiest part of developing Chiptune Champion? I wouldn’t say that any part of developing a game is easy. The visual design element has been what I’ve enjoyed the most, but it hasn’t been easy by any means. In game development, nothing just falls perfectly into place exactly how you imagined it. Whether it’s visual design, engine programming or whatever else, complications can and do arise, and often require a lot of trial and error until you eventually achieve what you were looking for. However, it’s very rewarding when you do reach that point. 7. What has been the hardest? Motivation has always been a big issue for me and this project has been no different. It’s difficult to continue putting in the time and effort everyday when there’s no guarantee that the game will be even remotely successful. I watch my greenlight page doing poorly and really doubt that anything will ever come of it. Additionally, this game has been the most complex project I’ve undertaken in terms of programming. There’s been some high level math involved with the track editor in particular and I’ve been left scratching my head on numerous occasions. 8. If your Greenlight doesn’t go as planned, what will you do next? I’m hoping that I’ll be able to see the positive side of it and take it as a learning experience. It’s my first attempt at something like this and I’m still quite young, so I would hope to use what I’ve learnt on a new project and give it another shot in the near future. 9. What other games are you a big fan of? I’ve always been a fan of simplicity in games, so I tend to play a lot of smaller scale indie games as opposed to larger scale AAA titles. Some of my favourites are Limbo, Risk of Rain, World of Goo and Bastion. I’ve also enjoyed some first person shooters over my time including CS:GO and, back in the day, Urban Terror (which I don’t expect a lot of people are familiar with). I highly recommend checking out Chiptune Champion, and voting for it on Greenlight if it gets your attention. The demo is also available there.